After all we’re just connecting power to our 12Volt stuff – it’s two wires, one positive, one negative, pretty simple really. Well it is and it isn’t. It’s certainly true that in DC systems we only have positive and negative wires, and both voltage and current behave very nicely so we can add them, subtract them, and even multiply them if we need to. So from that angle 12Volt systems are pretty straightforward. And if we can keep our negatives together and our positives together, but also keep them away from each other, then we’re already well on our way to a workable 12Volt system. That’s the easy part. The not-so-easy part is that we only have 12 Volts to start with – unlike 240Volt electrical systems where losing 12 Volts would probably go unnoticed. However if we lose even 1 Volt in a 12Volt cable, we have just lost more than 15% of the battery power to our cables. So how do we avoid this Volt-Drop in our 12Volt Cables? In 12Volt systems Volt-Drop is a really, really important thing to avoid, and is one of the most common sources of problems in 12Volt electrical systems. Fortunately the fix is pretty darn simple – we just need to get the cable size right for the device(s) that we are running. Yes, it is that simple! However unlike 240Volt systems where we choose the cable-size according to the current-draw, in 12Volt systems our main limiting factor is the Volt-Drop, and this is what will determine what size cable we need. For Automotive Cable, the size is expressed as mm e.g. 4mm twin Auto cable. This dimension has nothing whatsoever to do with the amount of copper in the cable – don’t ask – it’s an industry standard, and is used by the main cable manufacturers in Australia, so it’s here to stay – best thing is just to get used to it. 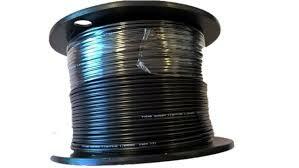 Then there is the B&S standard, which is fairly widely used, and also very close to AWG (American Wire Gauge). By-the-way B&S is for Brown & Sharpe that started this system in 1855. And just to keep things interesting the B&S numbers go down as the cable size goes up, so 6B&S is a bigger cable than 8B&S. And then there is cross-sectional area (usually in mm2 or mm-squared) which is the only one that has a scientific basis. If you cut through a cable, this is the area of copper you will see staring back at you. It’s also the only sizing system that can be used in calculations. Automotive cables, either single or twin conductor, are typically available in the industry-standard mm sizes of 3, 4, 5, 6, 9, 14, 20, 25, 35, 50, 70, 95, and 120. Fortunately there are tables showing equivalent cable sizes in B&S, cross-sectional area (mm2), so we can convert from one to the other. I have compiled one of those tables at the end of this article. Now, to be able to calculate the Volt-Drop in a cable, we need to know how much current is flowing through that cable. There is no getting around this by guessing, so somehow or another we need to get a figure for the Amps that the device is drawing. Usually this will be in the handbook or instruction manual, either that or get hold of the manufacturer or retailer and ask them. We need a figure in Amps or in Watts (which we can convert to Amps). If it’s in Watts then for 12Volt devices the current will be Amps = Watts divided by 12 Volts. If all else fails ask a friend with a multimeter to measure the current draw for you. Also look at the article on How much power does 12Volt stuff use? For fridges it’s important to use the maximum current draw to calculate volt-drop, and being a motor-driven device this will be highest on start-up. With Secop (Danfoss) compressor fridges, the start-up current is about 6-7 Amps for the smaller chest-type fridges, and for the larger and upright ones (80l and above) it’s closer to 10 Amps. For Engels, the startup current is simply the running current, because these start up slowly, so about 2.5 Amps for the smaller ones and about 4.5 Amps for the bigger ones. So we need to make sure we don’t drop too much voltage just when the fridge is trying to start up, otherwise it’ll simply cut-out on low-voltage every time it tries to start. This is a common fault with fridges matched to skimpy wiring – the fridge will go through a constant loop of start-stop, start-stop. Every time it tries to start, the sudden current causes the voltage to drop, and the fridge cuts out on low-voltage. Now the fridge is no longer drawing current, so the voltage rises and the fridge thinks all is ok and tries to start, so the voltage drops again and we are back to square one. I reckon if you sit around a campfire for long enough you’ll hear someone describe this exact thing – it’s that common. So to work out the Volt-Drop, we need the current in the cable, its size, and its length. The calculator then works out the volt-drop, based on using twin-core cable, so red & black together, for positive & negative. The cable size is the commonly available Auto cable (mm) – if you need to convert from another sizing format just use the table at the end of this post. In 12Volt systems we aim to stay on the friendly side of the Australian Standards, which says we should have less than 5% volt-drop. For 12Volt systems that is 0.6 Volts or less. In some cases the calculator might give us one cable size that is bang-on 0.6 Volt drop and then another size that is less, say 0.4 Volts. So you've now got one cable a bit bigger than you need, and one just on the edge, so it becomes a choice between 2 sizes (or more). If the decision is to go for the smaller cable, then it's clear how much voltage is going to be lost - and if we go with the larger cable then it's also clear how much we'll win by getting more voltage into the 12Volt device. So if it's for lights, no big deal - but for fridges (especially with a low-volt cut-out) it always pays to have as little volt-drop as practical and affordable. Inverters draw pretty heavy currents, especially the larger ones, so it's best to try and limit the volt-drop to 0.2 Volts or less. It also helps to keep the 12Volt cables short. The input current has spikes which magnify the volt-drop effect as well, and minimising the volt-drop in the 12Volt cables means you get more power out of the inverter. See also the article on Inverters. As mentioned before, current-carrying capacity is not usually the limiting factor in 12Volt systems, 9 times out of 10 it's the Volt-Drop that will trip us up first. But for short runs, about a metre or so, it is worth also checking that the cable can carry the maximum current. A word of caution: some cable brands use a rating of 60% duty cycle for 5 minutes for their larger cable sizes[*]. The huge currents in these cables are capable of doing real damage if they're used continuously at this rating – so please beware! To keep everyone safe, just make sure that the current rating is for continuous use at a sensible, practical temperature like 30°C. It is always better to run a twin cable directly back to the battery rather than picking up the negative from the chassis. The problem is not with conducting the current – the chassis is a huge chunk of metal so it conducts current very nicely. It's getting a reliable connection to the chassis that is the challenge. Not many of us would be prepared to angle-grind the chassis back to bare metal, through the paint and rust-proofing, and then weld or braze a lug or bolt onto the chassis. Far easier to simply run the positive and negative in a twin-cable direct to the battery, and just avoid this common fault-point altogether. And while we are talking about connecting onto the battery, Australian Standards says that any connection must have a fuse or circuit-breaker in the positive line, close to the battery. The battery is capable of many hundreds of Amps but the cables to our fridges and lights are not. So we always size the fuse or breaker to be smaller than the cable's maximum current. Marine cable is also stocked by the better retailers, and this includes a tinned layer over the copper in a normal Automotive Cable. This tinned-copper protects the cable from the "green-death" corrosion that so easily creeps into the cable strands in a marine environment. It is usually more expensive, but not by much, so if there is any chance of sea-water or even sea-spray getting to the cable, it's well worth the investment. This is the only way to connect a cable properly to terminals on 12Volt equipment or the battery. For the smaller cable sizes up to about 6mm auto, plastic crimp-lugs are the go, and they can be soldered or crimped. And a hammer is not a crimping tool – c'mon, they're not that expensive. For the larger cable sizes, like 9mm and up, the best is a proper tinned-copper lug. It makes a really good connection onto the larger size cables, and again it can be crimped or soldered. Soldering requires some serious heat for the bigger sizes, and patience, whereas crimping needs a proper hex-crimper. And again, a vice is not a crimper – rather find a mate or a tame auto-sparkie who will do it properly for you. Especially on the larger cables, it's just not worth the risk. This lists most of the common sizes for Automotive cable available in Australia, and converts among the three different cable-sizing standards. [*] For this cable-brand, rated at 100 Amps seems to mean it can only take 100 Amps for 60% of the time, and only for 5 minutes. What happens after 5 minutes is anyone's guess. I reckon just go for the continuous rating and be safe.